Scribd doesn't maintain the animations, so you may prefer to download it here. Data centers are the new steel mills, and every bit as hot. Just a few minutes ago, Equinix announced the acquisition of Switch & Data, at what I work out to be around 10x LTM EBITDA (10.5x if you use numbers up to Q2, and 9.5x using my Q3 guesstimate). I'm sure this is dramatic news for S&D shareholders, but it's really pretty unsurprising if you've been watching what's been happening in the space over the past three years or so, as I have. This is just the opening salvo in what I expect will be a new phase of consolidation, and I would expect European assets to be pretty high on the agenda. An adviser to Goldilocks has apparently been channeling the spirit of Horatio Alger, Jr., and unsurprisingly receiving some unsympathetic coverage in the process. Still, for good or evil, inequality is an inescapable fact of life, particularly in business. So setting aside investment banks, which other brazen, rapacious industry is shamelessly enjoying demand for its product outstripping supply three-to-one, with pricing up 15% this year, in the midst of the deepest recession in living memory? All hail the humble data center. Thanks to @kerryritz for the pointer on this very interesting presentation on the ATLAS Internet Observatory 2009 findings from the NANOG conference. The most interesting findings from my point of view are: 1) the rapid concentration of content sources (only 150 ASNs account for 50% of internet traffic, with CDNs accounting for 10% and Google alone for 6%); and, 2) the apparent decline of P2P in favor of streaming and direct download, although I find it notable that the authors point out that data is distorted by random port selection and the fact that 40% of P2P is encrypted. I'm in the process of putting together my slides for eComm next week in Amsterdam, and I wanted to ask for your input, gentle reader. If you would be so kind as to send me the three most critical issues which the communications (notice I did not say telecom) industry faces in future, I would be very interested to see them. By critical issues, I mean opportunities and/or challenges, both endogenous and exogenous. I'm just curious to see how your ideas line up against my own. Is it just me, or are the terms "2016 maturity" and "terrestrial broadcaster" not mutually exclusive? I have two tickets to eComm Amsterdam, 28 - 30 October, up for grabs. One is *F*R*E*E* and the other entitles you to a 50% discount. First come, first served, but please only ask if you are absolutely sure you are actually going to go. Holler at me. UPDATE: Well, that didn't take long. The free ticket is now gone, which leaves the 50% discount ticket. Don't be shy. I think I may have confused or annoyed a number of mega-uber value readers with my post on the arrival of the Memphibian blog. Make no mistake, it is not supplanting this humble bloglet, but during the first couple of weeks I had to ensure I had seeded enough content there to give it a life of its own. As in everything, I will strive for balance going forward. A couple of big validations for fiber in the week, with BT capitulating on brownfield FTTP, probably in recognition of the threat posed by Virgin's DOCSIS 3.0 marketing, and Telefonica trumping Vivendi's one-month old bid for Global Village Telecom at a 14% premium, with in-market synergies that Vivendi can't get anywhere near. The profound and ridiculous ends of the iPhone App spectrum were on display on Friday, with Herman pointing us towards the ludicrous (but entertaining) Gym Babes app, while the HealthMap project's iPhone app has generated 1,000 reports since launch a month ago. As the project team says, "This form of participatory epidemiology may alert the public to valuable disease information before it is reported by the media or public health officials," which is bound to have an inestimable value. All this is fascinating, though if Gartner is right in predicting that Android will eclipse the iPhone juggernaut by 2012 due to its open-source framework and multi-vendor backing, then presumably app developers are going to have to start hedging by developing for both platforms. This despite the fact that I am told repeatedly that investors currently have no time or appetite for anything non-iPhone in nature, and Kleiner Perkins Caulfield have taken a highly directional bet on iPhone hegemony. I think one of the first rules of marketing is that merely repeating an assertion ad nauseum doesn't make it true, particularly if the direct experience of your existing users shows it to be false. Yahoo! seems to be doing its best to pull the outdoor advertising marketing out of its deep recession with this campaign splashed all over London. Meanwhile, I have a colleague who uses Yahoo! mail, and for the past two months, he would say that the internet has been under the control of a Diabolical Denial of Service attack. I don't know if this is an isolated problem, or relates to his being a Mac user (as if that should really make any difference), but seeing his suffering, I am now programmed to ignore or laugh at billboards like this. Also, in case no one at Yahoo! 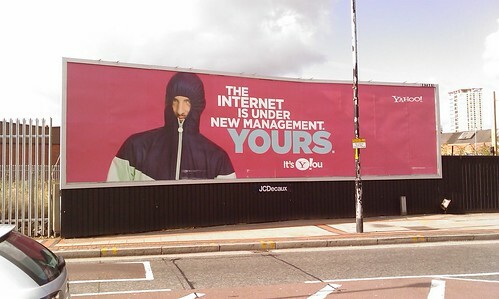 corporate had clocked it, hooded figures like this in the UK are associated with muggings and other pointless acts of antisocial behavior, so my guess is that drivers passing this billboard will immediately assume it is yet another government fear appeal message and pay no attention. One of my colleagues received this message today, which, apart from being risibly written and fundamentally ludicrous, points out just how mainstream Skype has become, if 419 scammers are invoking its name, particularly alongside that of Microsoft. > Internet globally together with enhancing improves the lives of citizenry. > claim have been fully processed and your winning Cheque delivered to you. It's quite probable that this will be of absolutely no interest to the vast majority of my mega-uber value readers out there, but on the off-chance that you are curious as to where I've been recently, I've been working on a purely personal side project, partly because it makes me happy, and partly because I feel I need to. It doesn't help that the past couple of weeks in telecom have left me feeling distinctly uninspired - is it just me?